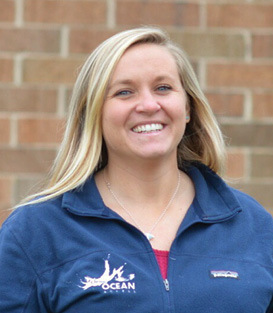 Bringing an abiding love of the sea to a grassroots organization dedicated to eliminating marine debris, improving coastal water quality and preserving shoreline access, Jessica Frascotti is the Program Coordinator at Clean Ocean Access in Middletown, RI. “After graduation, I moved to St. John and became an eco-tour guide, taking people on educational snorkeling, kayaking, hiking and paddleboard trips and teaching them about local flora and fauna and the history of the islands,” says Jessie, a Professional Association of Diving Instructors-certified Divemaster who holds a 50-ton U.S. Coast Guard Captains License. “I created a guide handbook detailing the local marine life, plants and more, as a training manual for fellow guides. I also worked as a first mate on multiple charter boats for day trips around the USVI and BVI. I took guests on educational snorkeling trips, teaching them about the coral, fish and other marine life and ways they can help to protect these amazing species.” Jessie also organized a community screening of the documentary Chasing Coral and created a newsletter to share information on preserving local and global marine ecosystems.